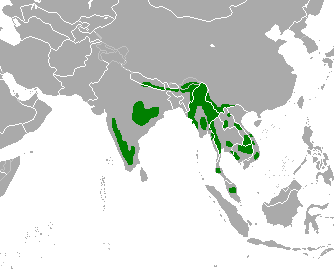 English: Range map of gaur (Bos gaurus) according to Duckworth, J.W., Steinmetz, R., Timmins, R.J., Pattanavibool, A., Than Zaw, Do Tuoc & Hedges, S. 2008. Bos gaurus. In: IUCN 2011. IUCN Red List of Threatened Species. Version 2011.2. <www.iucnredlist.org>. Downloaded on 04 March 2012.